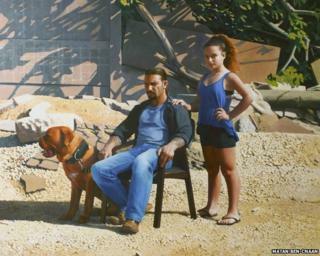 Israeli artist Matan Ben-Cnaan has won this year's BP Portrait Award. The 35-year-old was awarded the £30,000 prize for an allegorical portrait of his friend and step-daughter, titled Annabelle and Guy. The judges said they were struck by the "unnerving atmosphere" of the painting. The artwork can be seen at the National Portrait Gallery from 18 June when the Portrait Award exhibition opens to the public. It depicts his sitters as though they were facing tragedy in an echo of the Biblical story of Jephthah. In the story, an Israelite judge vows on entering battle that - should he win - he will sacrifice the first thing that greets him upon his homecoming, believing it to be a dog. However, on his return, it is his daughter who rushes out in welcome. Realising the tragic mistake he has made, he upholds his vow and sacrifices his child. "The judges were struck by the engaging filmic narrative of this neo-realist painting and the unnerving atmosphere that surrounds it," the panel said. "The painting's setting and the treatment of intense light and deep shadow was much admired." As well as the £30,000 prize, Ben-Cnaan will also receive a commission worth £5,000 to paint a portrait for the National Portrait Gallery's permanent collection. The second prize of £10,000 went to Leicester-based artist Michael Gaskell, who painted a portrait of his 14-year-old niece Eliza. It is the fourth time Gaskell has finished as the runner-up for the prize. The third prize of £8,000 went to Spanish artist Borja Buces Renard, for a portrait of his mother and brother Jaime sitting in the living room of his parents' house.